MUCH HAS BEEN SAID ABOUT THE SILVER TSUNAMI. WHAT CAN WE DO ABOUT IT? Indeed, few, if any societies have truly faced up to the magnitude of the long term elderly care crisis. 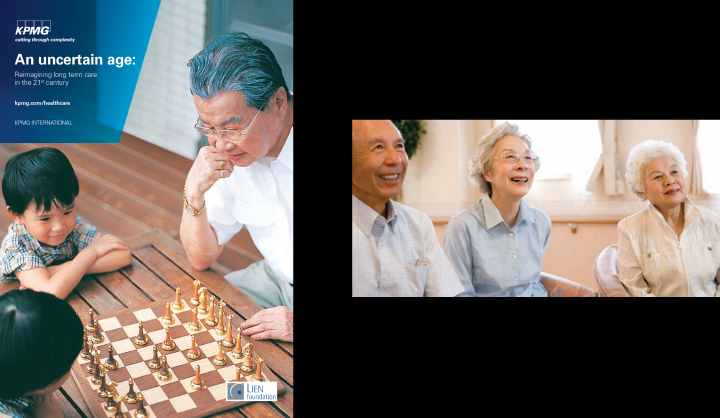 To examine this issue in greater depth, we commissioned KPMG to develop An Uncertain Age: Reimagining Long-term Care in the 21st Century. This study is based on interviews with 46 thought leaders, professionals and practitioners about current and emerging trends, and challenges in the eldercare sector across 14 countries and territories. Eldercare practitioners and thought leaders interviewed agreed that one of the biggest threats to the future of long-term eldercare is fragmentation. This has resulted in care systems that are focused on procedures of healthcare providers but neglect patients’ aspirations, dignity and needs. Policy makers and eldercare experts must collaborate in developing new solutions and methods for dismantling societal perceptions of ageing. WHAT ARE THE IMMEDIATE FIRST STEP THAT CAN BE TAKEN? Societies with rapidly ageing populations need to have societal conversations and build consensus around what long-term care means in their context urgently. Following that, more standards and guidelines for long-term care then need to be developed. Some suggestions were to use technology, carry out targeted staff recruitment and training, create innovative and sustainable healthcare funding models and urge citizens to save more for retirement and take up long-term care insurance policies.